One of my favorite things about holidays is gathering with family and friends and sharing good food. I’ll admit I don’t get too fancy with house decorations, but since once of my weaving goals is to clothe my house in handwovens I have taken to dressing the dining table with festive runners. Over the years I have woven everything from simple to complex. There are the last minute runners woven in plain weave on my rigid heddle loom using sparkly sock yarns and some lacy ones with elaborate fringes. Last year Barbara designed a set of runners in 4-shaft twill that are elegant and beautiful. 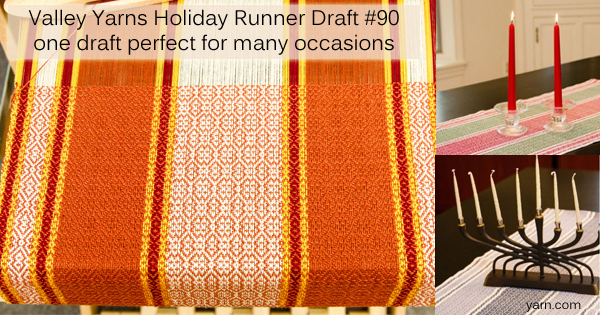 The Holiday Runner Draft #90 is shown in both Christmas and Hanukkah colors. This year I decided to change up the colors in the draft to create a Thanksgiving runner. It was fun to play with color possibilities in an autumn palette to create the warp and then I tried out a few options for the weft. 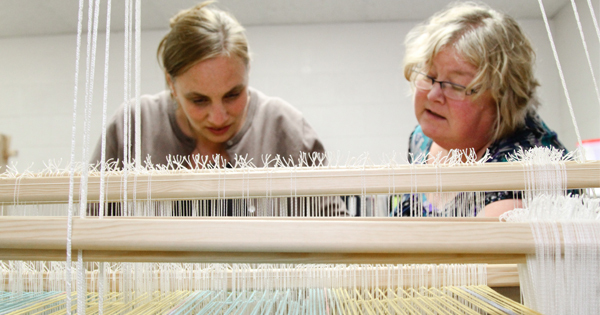 Each gives a distinct look, with textured areas where the weft and warp are the same color. I usually put on extra warp so I can experiment with weft colors and find the best look. If you try this, be sure to step away from the loom and view the weaving from a distance to see how the colors balance, this can be quite different from what you see close up. I’m kind of taken with this idea and plan to weave for other seasons and occasions. Maybe one in red, white and blue for the Fourth of July family reunion? What special events will you use as inspiration for woven table dressings? When I was at Convergence this summer I looked across the aisle and saw a table piled with what looked brightly colored UFOs. Imagine my surprise when I saw the person at the booth pick one up at start spinning yarn with one! My curiosity was piqued and I went over to check it out. I met Scott Snyder, the spindlemaker, and he told me the brightly colored arms on his drop spindles are made on a 3D printer. Talk about a modern twist on an ancient craft! I wondered about the plastic he used and he said he uses Polylactic acid (PLA), which is derived from renewable resources like cornstarch and tapioca roots and is biodegradable. These spindles are like a Turkish-style drop spindle, with arms that slide out of the cop, giving you a beautiful center-pull ball of handspun yarn.The Destiny features 4 arms that interlock on the shaft and is a hybrid variable weight spindle. It’s made of 3D printed plastic arms, hand turned hardwood shafts and steel screws. The combination of materials used allows for the mass to be on the outside of the spindle, to increase duration of the spin. The screws are removable so you can fine tune the weight of the spindle. You can choose either Mini or Medium depending on your size needs. Scott also makes a Turkish Glider, available with either 3D printed arms or finely polished wood. The Glider arms swoop outward with a slight upward tilt at the end, allowing the spinner to spin a lot of fiber in one cop. In addition to the fun and playful colors of the 3D printed spindles, we are also carrying the beautiful wood spindles that Scott makes. These also feature a shaft that is hand-turned on a lathe and have a small final at the top to hold the half-hitch. 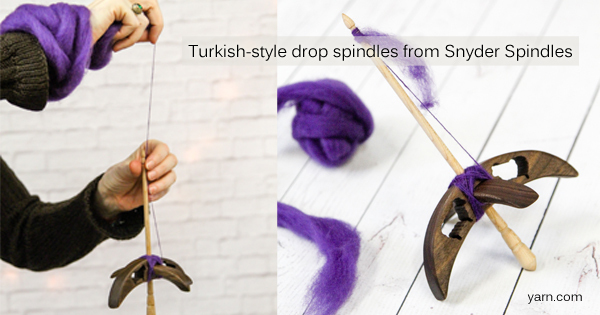 The wooden spindles are available in turkish and glider styles and, because I love anything sheep-ish, we brought in some that have sheep cut outs on the arms. If you like to carry your spinning with you and want a beautiful, portable tool, be sure to check out our new toys! My passion for fiber and color runs deep and I love to knit, weave and crochet, but I resisted the siren song of spinning because I was afraid. And then, two years ago I accidentally volunteered to be captain of the WEBS Spinzilla team and my worst fears were realized – I loved spinning! Down the rabbit hole I went and another fiber obsession has been added to my bag of tricks. 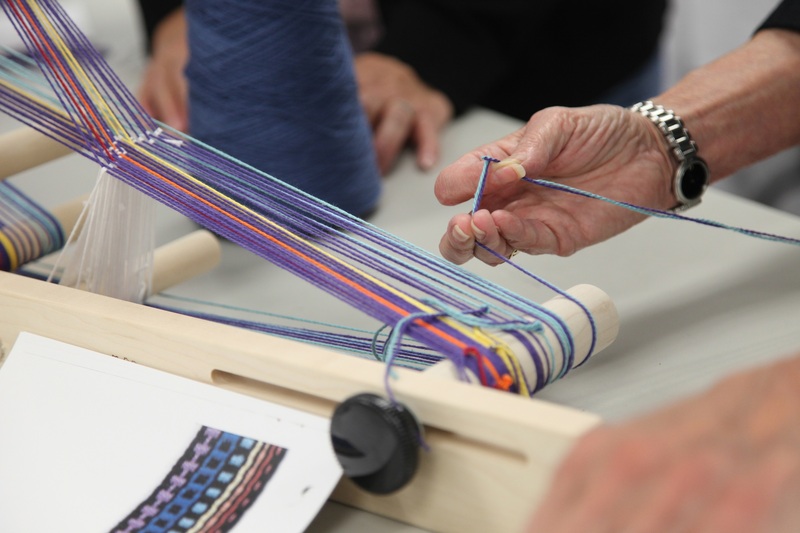 I was afraid that spinning would distract me from weaving – and it has – but it has also given me another way to create and deepened my understanding of fiber and yarn and how they work and interact – useful information for my other creative outlets. Of course, learning to spin opened me to a whole new world of color, texture and fiber and the overwhelming desire to have it all at my fingertips! I kept finding more things I wanted WEBS to carry and started organizing spinning events to learn more about the craft. More fiber, more spinners, life is good, right? The success of Spinzilla and the feedback from spinners at our events has brought a resurgence in spinning at WEBS. Steve and Kathy want to further strengthen our spinning area and decided to create a position to oversee that. I am honored that they asked me and excited to add spinning to my role at WEBS as Weaving and Spinning Manager. We still have a few fiber specials from Spinzilla to take advantage of. The fiber packs we put together with Louet are a great way to learn about how to spin different breeds. Each pack has just enough of each breed to develop your skill in spinning and enough variety to keep boredom at bay. There’s also some great colorful braids from Spunky Eclectic in the Autumn Welcome colorway she designed for us with 2 fiber options – easy to love and spin BFL or a luscious Polwarth/Mohair/Silk blend. 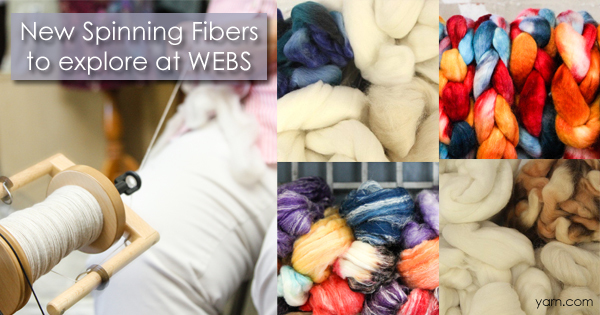 To round out the sweet deals, we have what my friend Liz calls a box of crayons – the Lamb’s Tail Medleys from Frabjous Fibers. Also in 2 bases – superwash BFL or Merino/Bamboo/Nylon – these are a random assortment of colors with unlimited possibilities. I am looking forward to expanding the fibers, tools and classes for spinners. Please feel free to contact me with suggestions; I want to hear what you’d like to see here! 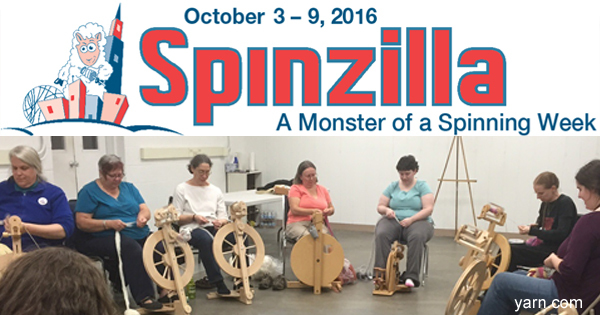 Yes, folks, we have circled the wheel of seasons and it’s time to get geared up for Spinzilla! It is a large event (worldwide! ), but I do realize that some may not have the slightest inkling of what I’m talking about, so let me explain: Spinzilla is a friendly competition sponsored by the Spinning and Weaving Group of TNNA (The National Needle Arts Association) that takes place during the first week of October. The challenge is to see who can spin the most yarn in one week, either in the team category or as an individual (“Rogue”) spinner. The underlying purpose, beyond showing the world just how amazing spinners are, is to deepen our spinning skills by pushing ourselves to spin, spin, spin – practice makes us better, right? And the fringe benefit of the event is that all the registration fees go support the NeedleArts Mentoring Program. WEBS has sponsored a team for the last 2 years and we are looking forward to another week of fun and fiber-full gatherings. Our team is already full but we know there are many more who’d like to join the fun as well as those who want to play but don’t want the pressure of competition (um, yeah, it can get a little intense on the team – last year we spun 126,000 yards!). So we invite you to go Rogue! Sign up as a Rogue spinner on the Spinzilla site and join us at our spin ins at the store. It’s a great way to meet local spinners, get inspired and pick up some tips, and share the laughter and camaraderie of other fiber-loving folk. Welcome to the Weaving Room! 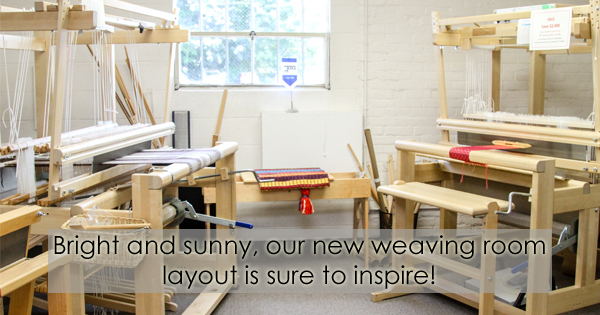 We recently revamped the weaving room at our store and it’s amazing how small shifts can completely open things up. If you are in the neighborhood, or just passing through, we invite you to drop in and see the changes. And if you live further afield, here’s a virtual tour of our dynamic showroom. The new arrangement not only feels more spacious and inviting, the layout allows us to showcase the different styles of looms and weaving. All of the tapestry looms are now together, so you can compare the Schacht, Mirrix and Hokett looms and decide which fit your needs the best. You’ll find beaters, bobbins and other tapestry tools there as well. 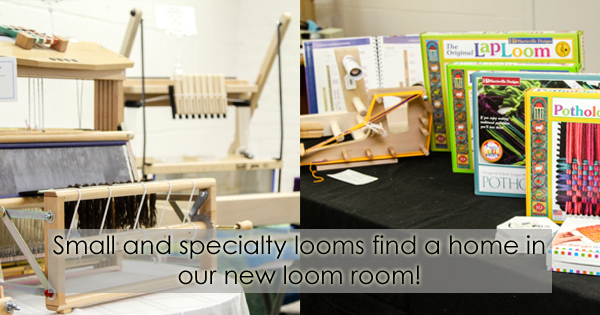 The small looms also have a home together on the table in the center of the room. Inkles and Inklettes are great for weaving bands that can be used for belts, straps and more. And if you are looking for a loom to start your young ones on, we have the ever-popular Potholder looms in addition to Lap Looms and School Looms. At the other end of the spectrum we have the Toika looms anchoring the front corner of the room. 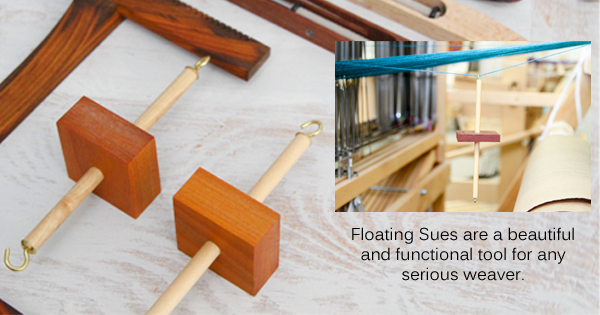 These great looms from Finland are available in both a traditional countermarch configuration or the computer-assist model with up to 32 shafts. We have drastically reduced the price on our floor model to make room for the new upgraded ES model. The floor model is a 40″ 16-shaft computer-assist Eeva and it comes with Weavepoint 7.2 software, a loom bench, 100 heddles per shaft and a cog wheel warp advance system. The discount is now 20%, which will save you over $2,000 and there’s only one, so don’t hesitate! We hope to see you soon in our new-and-improved space. Like many weavers, I have my favorite structures that I love to work with. At the same time I love to explore and try new ideas. Sometimes this involves an immersion in the new technique, with lots of reading and maybe yards of gamps and design work to understand it in detail. Other times I want to glean the basics about a structure and weave some projects without having to create my own designs. It’s a great way to see if I want to go further/deeper with that technique, or put to rest a fascination that turns out to be less-than-thrilling in reality. 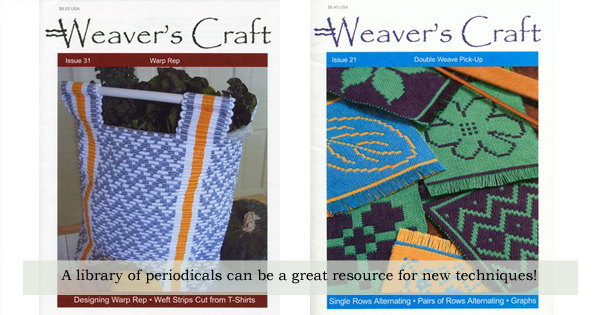 My favorite resource for such explorations is the periodical Weaver’s Craft, published by Jean Scorgie, former editor of Handwoven magazine and longtime weaving teacher. Each issue features a weave structure and presents a solid explanation of the concepts and interlacement of threads as well as 3 – 4 drafts for projects to put the information into practice. The articles are clear and thorough and all the drafts are for 4-shaft looms. She also includes sidebars and articles about basic weaving topics – threading heddles, reading drafts, finishing details. The most recent issue of Weaver’s Craft, #31, focuses on Warp Rep and contains many tips for weaving and designing with this structure. The drafts range from rug mugs and rep runners to a great tote bag with clever handles. One of my favorite issues is #21, Double Weave Pick-Up. She shows 2 different ways to work the pick up, with troubleshooting tips and great step-by-step photos. I love doing small projects to try new ideas and this issue has a series of rug mugs to weave with graphed designs to use plus info on how to graph your own designs. I’m looking forward to weaving a few sets of these. Where do you turn when you want to learn something new? I have a fondness for twisted fringe. It is so clean and elegant and adds a beautiful finishing touch to a handwoven piece. I took a stroll through our display racks to show you some fun variations to mix up the twisting. First there is the graceful sophistication of the long lace fringe on the Champagne Celebration Shawl. It’s like a luxurious waterfall that I just want to run my fingers through. Another exquisite touch is to add beads in the fringe. For the Zephyr Shawl the beads were added to a single end at the edge of each bundle and then that end was pulled into the adjacent bundle for twisting, resulting in a row of beads interspersed between the fringes at the end of the shawl. A different technique was used for the Plaited Twill Shawl to place the beads throughout the length of the twisted fringes. 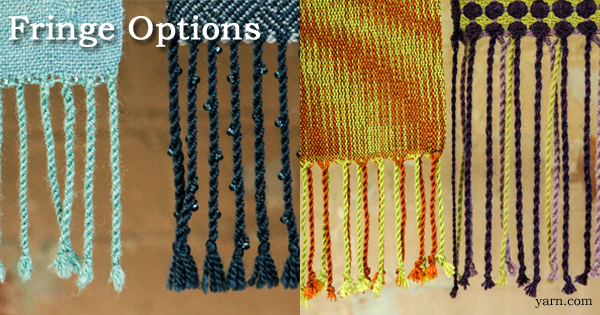 To achieve this effect, beads are strung on several ends of the bundle and held in place at intervals along the threads, the beads become locked in place as the fringe is twisted. If you have more than one color in your warp, there are a few ways to handle it. When there are random or asymmetrical color changes across the warp you can just twist in bundles across, ending up with some solid color twists and some with a barber pole effect when two colors twist together, as in the Labyrinth Throw and the Dornik Twill Throw. Another option that works well with a double weave or a more symmetrical color order is to twist the fringes in single color bundles. The resulting fringe allows each color to stand out on its own, looking crisp and clean. The XOXO Shawl is a deflected doubleweave shows this beautifully with all three colors represented in the fringe. And the fringe on the Turned Taquete Scarf shows both colors bold and pure, alternating across the edge. Many people twist their fringes by hand, but I prefer to use the Leclerc Fringe Twister. This handy and very simple device makes the work go quickly and saves me from hand cramps. Do you have any favorite fringe tips? Share your pictures, you know we love show and tell!